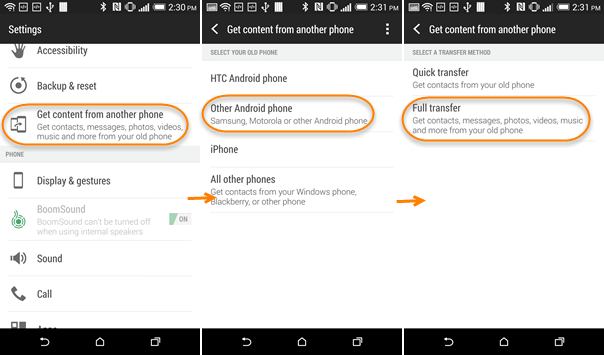 Home > Hot Topics > How to Use HTC Transfer Tool to Transfer Data to HTC One M9? As the HTC One M9 features more customizable options, many friends may have already changed the old Android phone with the new HTC mobile model. It’s a pleasant thing to unfold the box which contains the brand-new phone, however, setting up the new smartphone can be an annoying thing. Now we will show you an easy guide about how to use HTC Transfer Tool for transferring data from phone to new phone HTC One M9 quickly and freely. By using HTC Transfer Tool app, you can transfer data from old HTC phone, other Android phone, Windows phone, Blackberry and other phones to the HTC One M9. 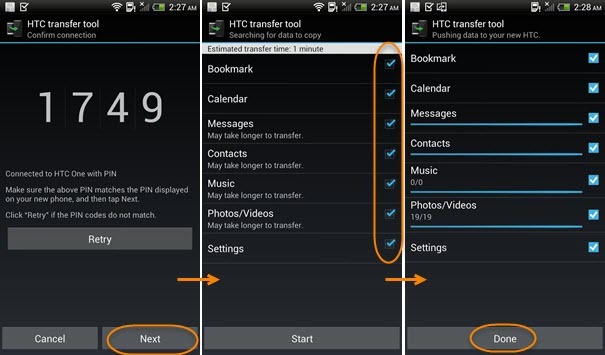 Contact list, messages, calendar events, music files, photographs, videos, browser bookmarks, phone display preferences and wallpaper can all be moved from old smartphone to new HTC phone by using the HTC file transfer tool. How to Use HTC Transfer Tool for Getting Data from Android to HTC One M9? Please visit Google Play store and search “HTC Transfer Tool” to find the app, then click install button to install the HTC data transfer tool on both old and new phones. You will be asked to sign in with your email adress before you can download the app from Google Play. Go to “Settings” -> tap “Get content from another phone” -> choose the correct phone type “Other Android phone” -> tap “Full transfer” -> tap “Next” to proceed transfer. Note: if you need to switch data from iPhone, Blackberry, Windows phone etc to HTC One M9, please choose the correct option. 3.Open the HTC Transfer Tool on your old Android phone, so that it will automatically detect the new HTC One M9. When the PIN code on HTC One M9 and old phone are the same, click “Next” to proceed. 4.Choose the file types that you need to transfer. 5.When it has finished transferring data, please tap “Done”. Now you can enjoy anything as you want on new HTC One M9. HTC Transfer Tool is a great yet free solution for those friends who need to migrate items from old smartphone such as iPhone, Samsung, HTC, LG, Sony, HTC, ZTE etc to new HTC mobile phone. If you still have trouble in about how to use HTC data transfer tool, please download the app for a try, it’s free.